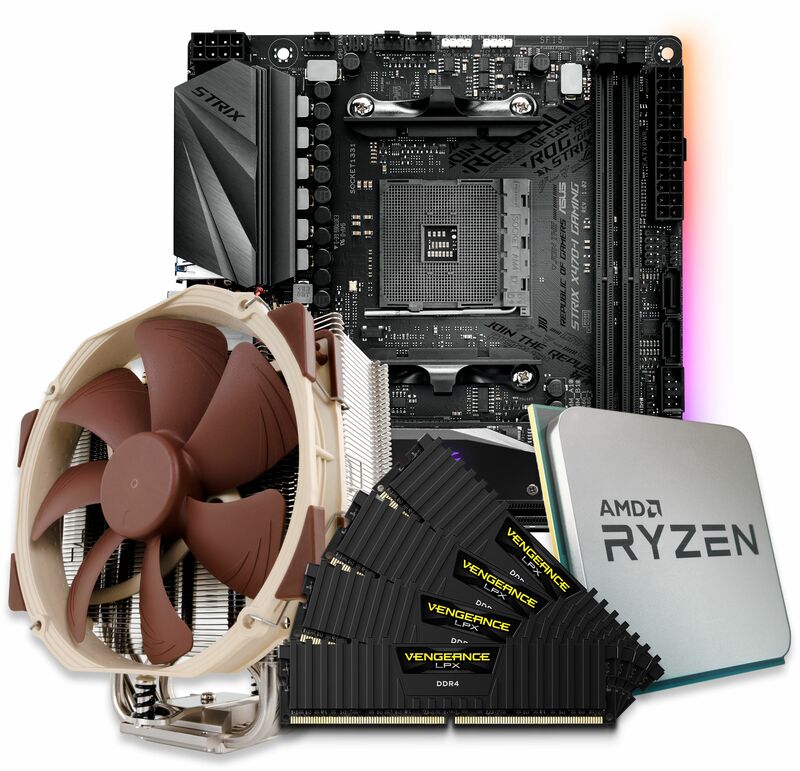 Based around AMD's latest CPUs, this pre-built bundle is ideal for customers looking to take the strain out of putting the core components of a PC together. This particular bundle includes a one of AMD's latest CPUs, ASUS motherboard, RAM from Corsair and your choice of either a fanned CPU cooler from Noctua or a fanless one from Nofan. As with all our bundles, our experts will assemble it and run specialised software to ensure it all works as expected prior to shipping. As with our fully built systems we only offer the very best components in our bundles. AMD's processors have achieved massive success recently and considering how well they perform it is not hard to see why. We have AMD's most popular 2nd Gen CPUs available, from their quad-core Ryzen 3 to their eight-core Ryzen 7. For cost conscious customers we have the dual-core Athlon 200GE with built in Radeon Vega Graphics. ASUS have been the UK's number one motherboard manufacturer for years. This particular bundle can be assembled with the feature packed X470 chipset or the B350 for customers who need to be more cost conscious. We have two brands available here, Noctua and Nofan. Noctua have catapulted themselves to be a contender as one of the best CPU cooler manufacturers with their high-quality and very quiet coolers. Nofan are currently the only CPU cooler manufacturer that produce a fanless CPU cooler for AMD's AM4 CPUs. Please be aware that if you choose the Nofan fanless CPU cooler your chosen chassis must have ventilation holes on the roof of the chassis to allow the warm air produced by the processor to naturally dissipate out of the system. In recent years, Corsair have expanded their product portfolio to include many different types of PC related products but they are most popularly known for memory. The memory we use in our bundles is the Corsair DDR4 Vengeance LPX running at 2666MHz. When building a new PC, we understand that it can be a nightmare to decide which components to choose and whether or not they will be compatible. If you take the plunge and go for one of our bundles, we guarantee that the components will work together flawlessly. These components are the same as we use in our fully built systems, therefore we are extremely confident they will work in your chassis of choice. The only thing to note is the height of the CPU cooler. The table below gives the height of each CPU cooler that is available in the configurator. Please make sure your chassis will accommodate whichever CPU cooler you choose. If you are unsure feel free to contact us, letting us know which chassis you plan to use and we will advise accordingly. If you would like to choose an alternative CPU cooler that we stock but is not available on the configurator, then please let us know and we will confirm its suitability. It is not unknown for PC components to fail even if they are brand new. If you choose a bundle from Quiet PC, following assembly we will put the components through two tests. The first test checks the memory with the second test checking every other component in the bundle. These tests run over a period of 24 hours and burn-in all the components. We also update the motherboard to the latest BIOS and configure it accordingly. This quality control procedure gives you peace of mind that the components are working as you would expect. We also offer a full 24 month return to base warranty with all of our bundles. This means if you come across any issues with the components in the bundle, just get in touch and we will get you back up and running in no time. Please click the round question mark after each product to view more detailed specifications. 3.4GHz AMD Ryzen 5 2600 65W 6C/12T 16MB CPU (Requires Graphics) ? 3.6GHz AMD Ryzen 5 2600X 95W 6C/12T 16MB CPU (Requires Graphics) ? 3.2GHz AMD Ryzen 7 2700 65W 8C/16T 16MB CPU (Requires Graphics) ? Noctua NH-L9A-AM4 Low Profile CPU Cooler (Max 65W CPUs) ? Noctua NH-L9x65 SE-AM4 CPU Cooler (Max 95W CPUs) ? Nofan CR-80EH Copper IcePipe 80W Fanless CPU Cooler ? Noctua NH-U12S SE-AM4 Ultra-Quiet Slim CPU Cooler with NF-F12 fan ? Noctua NH-D15 SE-AM4 Dual Radiator Quiet CPU Cooler with two NH-A15 Fans ?